Herbicides are used throughout the world to combat the growth of unwanted plant life. These polar compounds are hydrophilic, so they may find their way into drinking water sources. 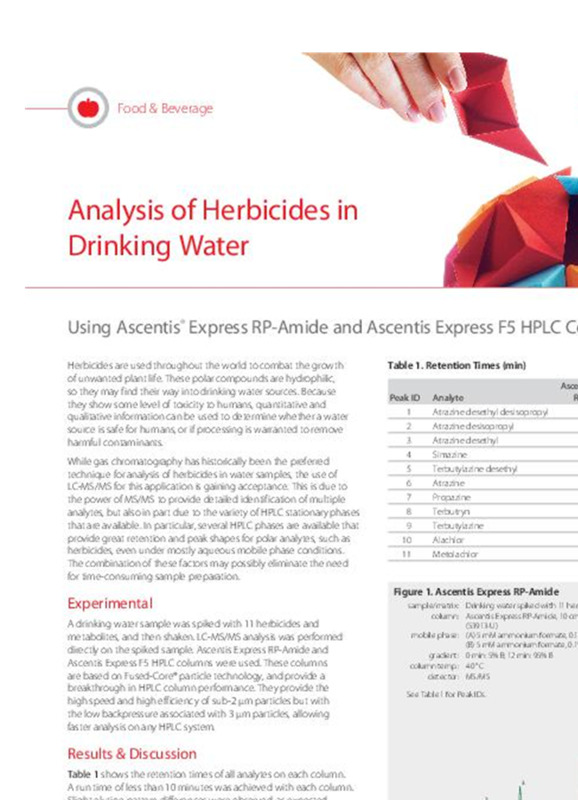 While gas chromatography has historically been the preferred technique for analysis of herbicides in water samples, the use of LC-MS/MS for this application is gaining acceptance. This is due to the power of MS/MS to provide detailed identification of multiple analytes, but also in part due to the variety of HPLC stationary phases that are available. In particular, several HPLC phases are available that provide great retention and peak shapes for polar analytes, such as herbicides, even under mostly aqueous mobile phase conditions. The combination of these factors may possibly eliminate need for time-consuming sample preparation.